It’s always an impressive snapshot this tasting, a litmus test for the vintage if you will, illustrating with some clarity exactly what can be expected from Hunter wines from a given vintage (particularly given the array of single vineyard wines on tasting). Broad vintage generalisations are dangerous I know, but this does give something of an inkling. (What are the Private Bin wines you ask? Have a squizz at the notes from last year’s tasting for some context). like the ‘Old Patch’ Steven vineyard – struggling in the heat). A very solid vintage regardless, with Chardonnay and Shiraz the stars. Similarly – or contrastingly depending on how you look at it – the 2010 reds are a variable lot, with the stop-start, warm-wet 2010 vintage producing reds that are occasionally a fraction light and simple. or can conversely look a little under and overripe, mirroring the rain/heat/rain harvest conditions. A fair to good vintage then, with big variations between the two. As ever all these wines are available only via the Tyrrell’s Private Bin (club) or via the Tyrrell’s cellar door. Private Bin prices are listed below (More information here. 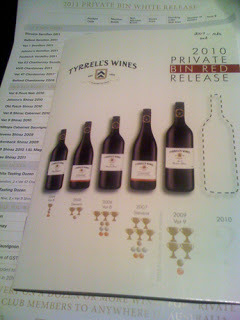 Geez I deserve to be on the Tyrrell’s payroll – Chris Tyrrell I’ll take payment in some of those 09 Vat 9 Shiraz magnums :)). Made from the oldest/best blocks on the red soil Ashman’s property, this is hand picked and open fermented then matured in new and one year old French casks (2700lt). A blend of Hunter Shiraz off the Ashman’s property with 8% Cabernet Sauvignon from the Mullaney propery just outside of Young in the Hilltops. Open top fermentation with the parcels kept separately until blending and then finished off in French oak barriques until bottling in May 2011. 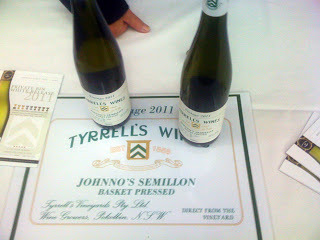 Sourced from Neil Stevens’ Old Hillside vineyard (the same one as the Old Patch). Open fermented, hand plunged in open vats this was matured in French oak for 16 months maturation in 30% 225lt barriques, 70% in newer 2800lt caks) before bottling in June 2010. Thanks for that Andrew. I'm almost glad that 2010 isn't a rip-roaring vintage for Hunter reds, after all the expenditure of 2007 and 2009. Yes, the '09 Stevens Shiraz is a good 'un. I put 3 away. Same score too, I think. I also like the '09 Brokenwood, but it actually needs a long decant to get the best out of it. Red dirt and red fruit for sure. I'm still thinking about which of the Tyrrell's Private Bin stuff I'll buy this year. Belford Chard/Vat 47, Stevens Shiraz, Vat 9, Johnno's Sem. My wife arranged a private tasting last week for our anniversary. Scott took us through the vineyard and the winery, before taking us through the private bin stuff. We ended up getting a pretty eclectic mix, but not a huge amount of anything in particular. We both were quite surprised at the quality of this years Vat 6, and the Single Vineyard Cabernet Sauvignon. We didn't taste the new Belford or Stevens Sem, but the Johnno's was a cracker.